I am a typical movie lover and prefer to see the good ones on the big screen. We went to the movies yesterday and I saw Lincoln. I think I had something more in mind and was a little let down, but it still was good. The acting was wonderful, and the writing excellent, but I am an action junkie. Yes, you heard that right, I don't like chick flicks. I have watched chick flicks, but usually at home. To me, if I am going to spend that much money, I want to see action and special effects, not heartwarming. It drives my friend nuts. She always suggests going to the movies, and I always remind her that our tastes are different. I like movies with really good stories, and I am a tough critique, but give me something I can sink my teeth into. Such as, Starwars, Underworld, and Lord of the Rings. I have enjoyed the stories they came up with for the hero's when we were kids, like the Green Lantern, Thor, and Captain America. The story of Snow White and the Huntsman was good, but one of the actors kinda ruined it and some of the writing was dull. I did like Prometheus because they mixed the Ancient Alien theory with the story, and the action was cool. But again, some of the writing was not so good. Sometimes, I feel at though the directors take shortcuts, and I will pick up on it quick. They shorten scenes that should be more intense. Not only with action, but also with the characters. I need to know the characters in the movies, just as if I were reading a book. And, I absolutely hate it when they set up a movie for a second one, and never come out with the second one. Are you a movie junkie? Do you ever feel like you were cheated after seeing a movie? Here lately, I have felt that way several times. Yes, Lincoln was good, but there were parts that I was bored. And, It's not because it was politics, because I do understand it, it was because it did not put you there. I do recommend the movie and give it 4 stars. If you respected Lincoln and what he did for our country, then it is a must see. Until Thursday, have a great week and don't forget to drop me a line. If you have seen Lincoln, let me know what you thought. I often feel cheated with many movies of recent years. My wife is a big action fan so I try to mostly get movies that I think would appeal to her since I like all kinds of films. We both hated Prometheus. It lacked in decent action and the story was rather absurd. We tend to prefer the movies that are more grounded in realistic ideas and that are fast paced. I'm interested in seeing the new Lincoln movie but as with all films we'll wait for the DVD. We did watch Abraham Lincoln: Vampire Hunter last week and both loved it. Fun action and the story was woven well into actual history. Sometimes I wish there would be less emphasis on special effects and fast pacing and more on story exposition. Sounds to me like I need to check out Vampire Hunter lol! Maybe i'll rent that this weekend! Thanks for the comment Arlee! My taste in movies, as with books and music is so eclectic that I can get into just about anything. I haven't seen Lincoln yet, but I have so much respect for Daniel Day Lewis as an actor, that I plan to do so. All the other movies you mentioned are also movies I like and I totally agree with you about Prometheus, the writing was weak, and Snow White and the Huntsman, the one actress was, well, not noteworthy. 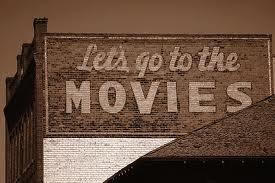 I like chick flicks, but I prefer to watch them at home, although I will see them with my daughter and sometimes with girlfriends, on the big screen. However, the big screen was made for blockbusters, the movies with big special effects and big stories. And, yes, you need to check out 'Ol Abe in Vampire Hunter. It was a delightful escape, but . . . the book was better. The books are always better! I did rent it though and Rick and I loved it! Lincoln was okay. I think it was too long and certain scenes too drawn out. The acting was fantastic though!